St Vincent and the Grenadines are 32 Islands and cays that form part of the Windward Island chain of the Lesser Antilles . They form a barrier between the Atlantic to the east and the Caribbean Sea to the West. 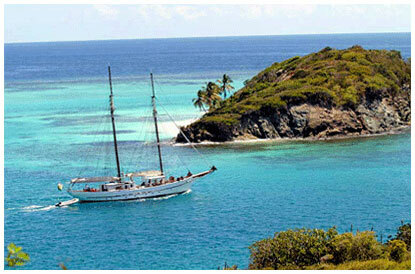 There are over 100 small islands making up the Grenadines, some belong to Grenada and the rest to St Vincent. The Grenadines belonging to St. Vincent include Union Island, Mayreau, Canouan, Mustique, Bequia, and many other uninhabited cays, rocks, and reefs. The land area of St. Vincent island is 344 sq km and the total land area of the country is 389 sq km with Bequia being the largest of the Grenadine islands belonging to St Vincent. The port city of Kingstown, capitol of St Vincent and the Grenadines, is one of the most picturesque in the Caribbean. This uniquely beautiful archipelago of islands boasts soft white powder sandy beaches, clear blue waters and a rugged mountainous terrain of lush tropical rainforests, where coconut and banana trees grow. St Vincent is an island of natural beauty with breathtaking mountains and valleys, rivers, cascading waterfalls and La Soufiere, one of the worlds most studied active volcanoes. The forest is home to the spectacular St. Vincent parrot, Lesser Antillean tanager and the Whistling Warbler. Sailing these turquoise waters is a unique and fascinating experience. With numerous types of dolphin found in Vincentian waters, including Spotted, Spinner, Fraser, Rissos and Bottlenose there is always a leaping and splashing display waiting for passing yachts. If you are a whale lover then you can observe Orcas, Pilot and the occasional hump back whale, so have your cameras ready as they are sights you would not want to miss. Most of the islands are fringed with coral reefs and the extraordinary variety of tropical reef fish and organisms makes snorkeling and diving a bright and colourful experience. The visibility in these waters is excellent due to the density of volcanic/granite based sand that falls quickly when disturbed. If you are very lucky you may also see Leatherback and Hawksbill sea turtles, these are currently endangered species. 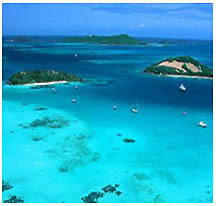 The waters are so pristine that the travel awards 2006 awarded St Vincent and the Grenadines the Diving Island of the Year. Ocean birds such as ospreys, pelicans and frigates can also be seen catching their lunch on the reef. st vincent & the grenadines is a superb bareboat yacht charters caribbean destination as well as a popular crewed sailing holiday choice. With beautiful caribbean islands such as bequia, mustique, union island, the tobago cayes & saint vincent itself to visit you will not be disappointed. A variety of monohull, catamaran, powerboat and luxury yachts - bareboat, skippered or fully crewed are available.